Roughly 2,000 people gathered outside the Wal-Mart’s doors in the predawn darkness. Chanting ‘push the doors in,’ the crowd pressed against the glass as the clock ticked down to the 5 a.m. opening. Sensing catastrophe, nervous employees formed a human chain inside the entrance to slow down the mass of shoppers. The mob barreled in and overwhelmed workers. This happened at a Long Island Wal-Mart in 2008. The folks at Black Friday Death Count have listed one death this year. A teen driving home from a Black Friday sale in North Carolina. Yes, that could happen to anyone returning from an event that starts at zero dark thirty. But the injuries to an 11 year old girl who was trampled in a Wal-Mart in Ohio wouldn’t have happened were it not for the doorbuster frenzy created by stores like Wal-Mart. Anyone else sickened by the the fact that this has been happening so long that they can track it year over year? Yea for reduction of injuries and deaths but boo to it STILL HAPPENING. I’m friends with some of the people who organized the Black Friday protests. As of today over 110 were arrested. I wrote about ways the Wal-Mart lawyers were convincing judges to require protesters to pay $10,000 to protest around Wal-Mart. Their message is clear, “We will not change our sales strategy, even if it kills people.” Instead they focus their energy on attacking their critics, making them pay to protest. So how about, in the name of public safety, we flip this? New Rule: If you plan a DOORBUSTER STUNT you need to put up a $10,000,000 bond to cover the costs to the community and to cover the injuries and deaths of the people. Lets go to cities and get them to pass laws, “Doorbuster stunts will cost ten million dollars for each store, payable in advance. If nobody is injured or dies the store gets part of it back.” Suddenly the cost effectiveness of this media stunt goes away and they will need to figure out a different way to get press and sell crap. “But Spocko!” I hear you cry, “The Chamber of Commerce thugs will wail! This is a tax on business!” Well sure, but the companies don’t have to pay it if they don’t do one. Plus, if they do, the communities can get back some of the revenue their city fathers gave away with all those tax breaks they gave them. Money that didn’t go back into the community, but to the richest people in the world. Speaking of corporations taking money out of communities, do you suppose that the richest communities have lots of Black Friday Doorbuster deaths and injuries? I doubt it. These sales are targeted at the people who are squeezed. 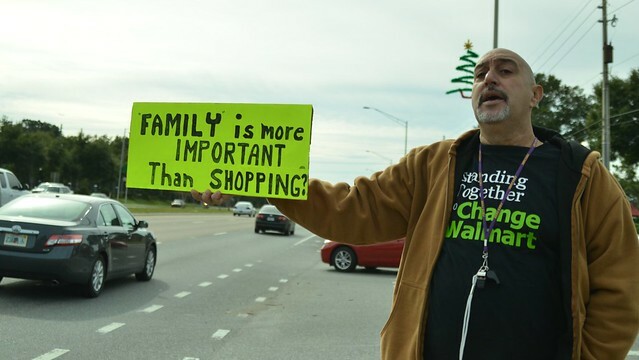 If a community requires those Wal-Marts to pony up, to that community, that money is coming from Wal-Marts in the rich communities, not their local community. Doorbuster sales are PR stunts for the Media. I’ve worked in PR and marketing for decades. I know a stunt when I see one. I’m kind of old fashioned Vulcan though, a stunt in which customers get injured or die was considered bad PR in my day. In the beginning I’m sure it was fun. “Give the TV cameras something to focus on, get them out to the store! We are making the news!” That was until it went horribly, tragically wrong. Again and again. But they still didn’t stop. Why not? Was it, “Nobody could have predicted…” even after the first few years? Why are Wal-Mart and others are still using this stunt? Because the news media likes it. Maybe this time it won’t just be people lining up to get into the store, they might die! Capturing a live death on the air? That’s breaking news, baby! What was supposed to be a feel good story has turned into a deathwatch. But any PR is good PR, amiright? No! 1,000 times no! Starting now I’d like to suggest people think of ways to stop this stunt next year. Let’s put the responsibility for fixing this potentially deadly stunt right where it belongs, on the people who create them and hold them. If it costs more to do the stunt than to not do it, they will change their PR/media strategy. If Wal-Mart can find a friendly judge to demand protesters pay $10,000 to hold a peaceful protest OFF of Wal-Mart property, I’m sure we can find some judges who will demand Wal-Mart pay $$$ every time they hold a potentially deadly PR stunt. When I used to hold events at a venue I was required to have insurance, why shouldn’t they?